To us, there are fewer things more tempting than a mountain of mussels. Even for those sceptical of these gorgeous shellfish superstars, you have to admit – these look incredibly tempting. 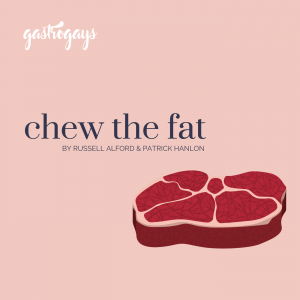 If we’re really trying to convince you, better yet, they’re packed full of protein and iron, take mere moments to cook and certainly don’t break the bank. Flavour, value, time. Tick, tick, tick. 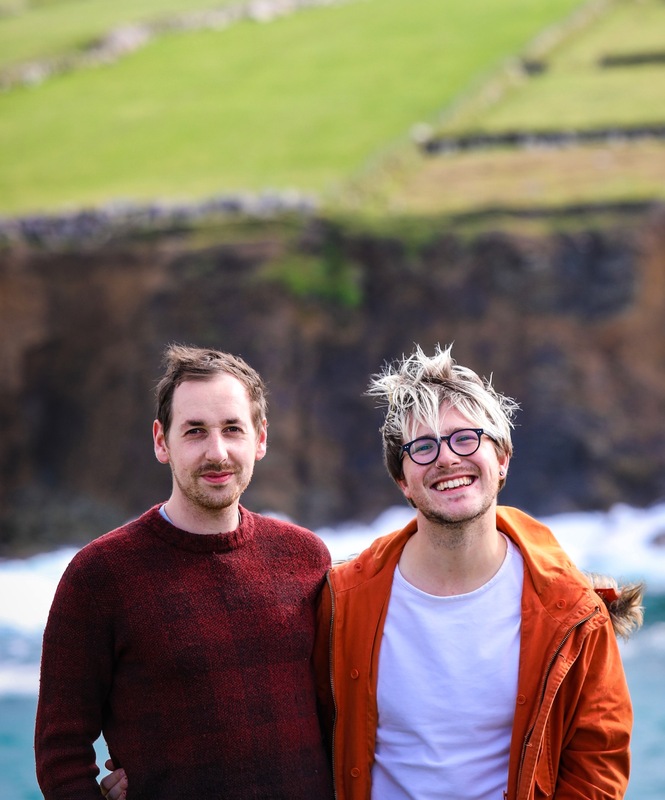 We’re big believers in Ireland needing to change its relationship with seafood. We’re getting there, slowly. But as an island nation, with this beautiful bounty of incredible seafood available off our shores, it’s a crying shame we don’t appreciate this abundance more in everyday cooking. 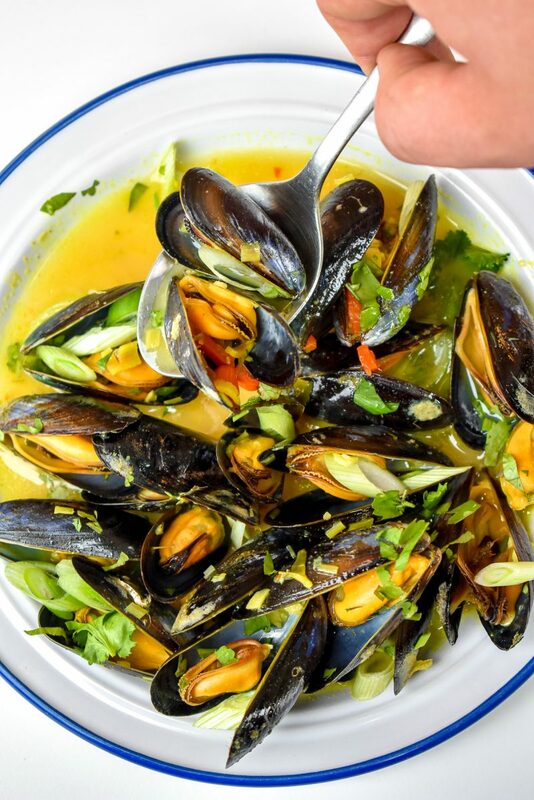 Whether cooked simply with garlic and a white wine broth with a pile of chips, or packed full of spicy flavour, mussels will forever be a favourite of ours. We’re delighted to be teaming up with Bord Bia, Ireland’s food board, this summer to support their #FlexYourMussels campaign. We would love you to think about picking up a portion of fresh mussels in the supermarket next time you’re browsing the aisles and looking for dinner inspiration. If you’re not a dab hand in the kitchen, why not consider mussels the next time you find them on the menu when dining out – trust us, they are bursting with gorgeous sweetness and take on other flavours marvellously, so it’s the perfect blank canvas for a full-on flavour dish. For us, this recipe was meant to be shared. Served family-style in the middle of the table, on a warm day, outside, with some ice-cold drinks to enjoy alongside – pure bliss! 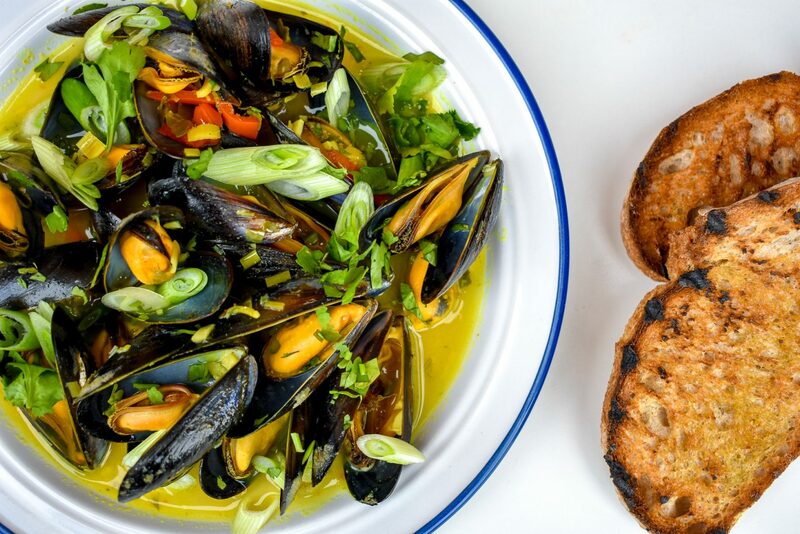 The Asian flavours here aren’t overpowering or overly spicy, just a gentle burst that makes these meaty mussels even more delectable and additive. 1. Put the lemongrass, kaffir lime leaves, chilli, ginger, garlic, turmeric, sugar, fish sauce, soy sauce, lime juice and zest into a blender and whizz together on high speed. Add a dash or two of water if necessary to help it come together into a paste. 2. In a pot, on medium heat, fry the paste in a little coconut oil for 10-20 seconds before adding the coconut milk and cooking on medium-low for five minutes. The mixture will go gorgeously golden and fragrant. 3. Add the mussels, cover with a lid and cook over a medium heat for a couple of minutes. Shake the saucepan every minute or so to ensure even cooking and when all the mussels are open, it’s ready to eat! Discard any that have not opened – you don’t want to eat those. 4. Serve in a big tray or pot, strewn with pink pickled onions, a scattering of freshly chopped coriander and spring onions with crusty sourdough bread on the side for mopping up that incredible sauce! 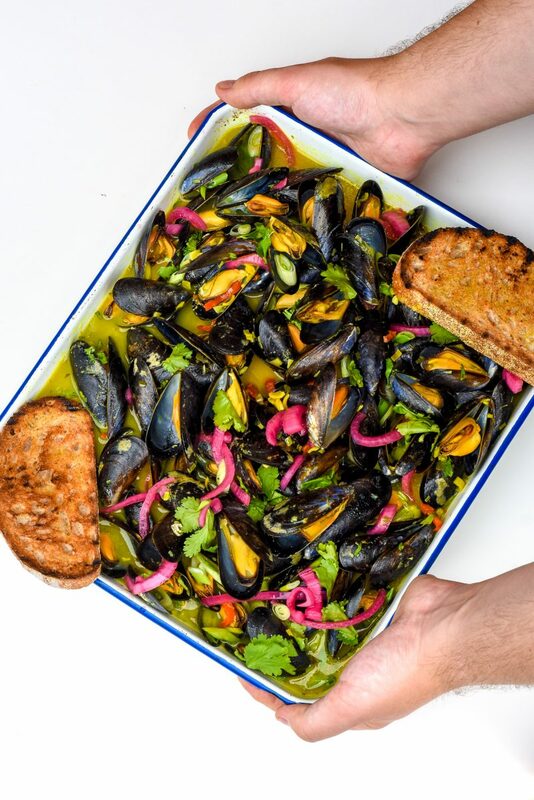 This is a sponsored post in conjunction with Bord Bia to help promote #FlexYourMussels, a campaign highlighting the benefits of eating more mussels this summer. 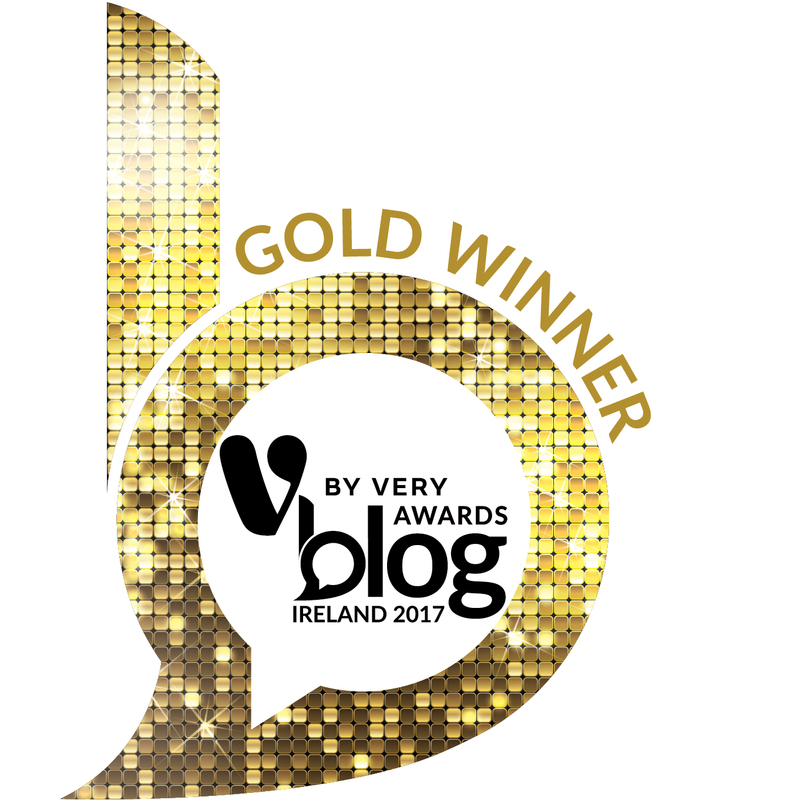 For more recipe inspiration, visit the Bord Bia website.